—and I looked up current weather in Buffalo. That’s not normal November weather for Buffalo. For the last two months I’ve been writing, and rewriting, a brief introduction for this catalog … painstakingly going over a few short paragraphs and trying to come up with a concise statement about Sea Change. Nothing was right. The text was incomplete, and I didn’t know what was missing. Sea Change is nascent; it’s a work in progress. I’ve just begun to revisit some of my past work and think about how it might be shown in a different context. Honestly, I have no idea how Sea Change will culminate as a finished piece. And that’s what was missing in this introduction … being able to articulate the uncertainty about how this work will move forward, while being certain this exhibition is the start of an ongoing, long-term project for me. Climate change has been a visible theme running through my work since 2005, but I didn’t see it in my photos until this past year. 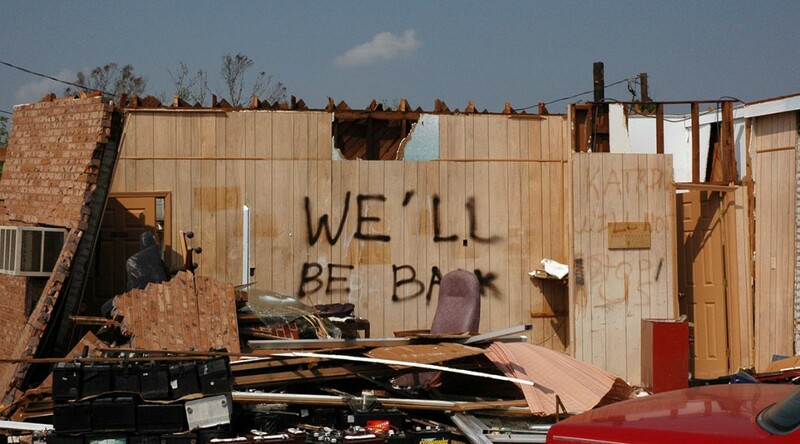 It’s present in a series of photographs I made on the Mississippi Gulf Coast a few weeks after Hurricane Katrina made landfall. And it’s there in a body of work I made in Southern Louisiana after the BP Deepwater Horizon blowout. I made a small series of photos in Tom’s River, NJ and Staten Island, NY about a month after Hurricane Sandy came through. It’s in there, too. Unlike the “unnatural” BP Deepwater Horizon industrial disaster, Hurricane Katrina and Hurricane Sandy appeared right out of the air. Hurricanes are “natural” disasters, but both of these storms formed in an atmosphere that’s been changed by human activity. After Hurricane Sandy, I saw places I knew destroyed by a storm that formed in “human-induced climate changed” air, in the same warmer and moister air that formed Hurricane Katrina. Like the BP disaster, the storms were environmental catastrophes tied to human behaviors. Although I’ve made photographs in communities contending with environmental issues, I never consciously addressed climate change in my work. I didn’t look to document it, and I didn’t identify it when editing or sequencing my photos. I didn’t see it. Climate change was abstract. Environmental disasters were concrete. Of course, that’s not true. I didn’t want to admit that we’re already living with environmental crises connected to climate change. It’s painful to acknowledge, but I can see it now. I can see it in those photographs.